Smart lawyers know the caselaw. Here, practicing attorneys are injected with all the latest criminal nuggets of valuable legal information. 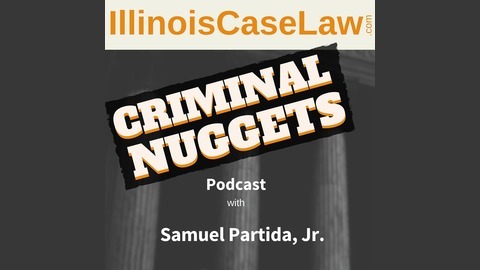 Listeners walk into criminal court immune from ignorance on the latest decisions. 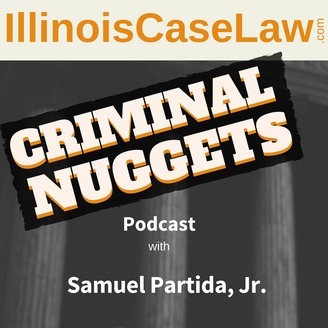 The tidbits and key points Illinois appellate judges are making are no longer hidden in voluminous text. For the first time in their careers, practitioners don't have to invest the enormous amounts of time usually required to sift through hundreds of pages of legal text. Now, their ears serve as the portals to vast, instant knowledge. Audio law learning not only will make you the smartest lawyer on the case, you will also have fun! And its all FREE. Defendant's conversation with his buddy is recorded and his friend kept telling him he always takes things to far. Defendant was convicted of murder. He shot a killed a guy. Prior to trial, defendant again tried to exclude recorded statements by filing a motion in limine to preclude the introduction at trial of a conversation between defendant and co-arrestee that took place in adjacent rooms at the police station shortly after the incident. Defendant stated that he had asserted self-defense and the reasonableness of his actions was directly at issue. As the victim was returning from purchasing cocaine and said, “What’s up?” to defendant, who was about 10 feet away from the victim. Defendant walked toward the victim, shot him three times, and ran to the back passenger seat of the Taurus, which left the area. Shortly after the shooting police stopped the car. Defendant had a gun on his lap. Defendant, a female driver, and defendant's buddy were all arrested and taken into custody. They were taken to a police station and placed in separate rooms. Defendant’s and his buddy’s rooms were across from each other. Each room had video surveillance that was activated the entire time each person was in custody. A video camera is permanently mounted in the corner of each room and records anything that happens inside the room. At one point, the men started talking to each other in Spanish. On the video and the recording you hear the buddy just wanting to know what happened. He wakes up in the car and the police are arresting everybody. He’s asking defendant what happened. "We did a f*** job, dude. I did it. I caught—I caught an a*** over there, dude. I caught a f***, dude. I let him have it, dude. Dude, you were—you were sleeping or very drunk, dude. I filled a guy with lead close range, n***. Close range—I filled him with lead, dude. He fell, dude, in front of me, dude. And when I—and when I tried to fill him up with lead again I didn’t have anymore, dude. I let him have like four or five, dude. Hey dude!" A defendant is legally accountable for another person’s criminal conduct when “either before or during the commission of an offense, and with the intent to promote or facilitate that commission, he or she solicits, aids, abets, agrees, or attempts to aid that other person in the planning or commission of the offense.” 720 ILCS 5/5-2(c). To establish that a defendant intended to promote or facilitate a crime, “the State may present evidence that either (1) the defendant shared the criminal intent of the principal, or (2) there was a common criminal design.” People v. Fernandez, 2014 IL 115527, ¶ 13. “Under the common-design rule, if ‘two or more persons engage in a common criminal design or agreement, any acts in the furtherance of that common design committed by one party are considered to be the acts of all parties to the design or agreement and all are equally responsible for the consequences of the further acts.’ ” Fernandez, 2014 IL 115527, ¶ 13 (quoting In re W.C., 167 Ill. 2d 307, 337 (1995)). At the hearing on defendant’s motion, the State asserted that his buddy’s words added context to the conversation. Defendant argues that the court should have excluded the statement that defendant had gone “too far” and the numerous statements about “you guys” taking things “too far.” Defendant asserts that the tacit admission rule is flawed and at a minimum should not apply here because defendant was in police custody when the statements were made. Under the tacit admission rule, a defendant’s silence may be introduced as a tacit or implied admission of guilt if the defendant remains silent in the face of an accusation of criminal conduct. People v. Sneed, 274 Ill. App. 3d 287, 295 (1995). When an incriminating statement is made in the presence and hearing of an accused and the statement is not denied, contradicted, or objected to, both the statement and the failure to deny it are admissible at trial as evidence of the accused’s acquiescence in its truth. People v. Childrous, 196 Ill. App. 3d 38, 53 (1990). (1) the defendant heard the accusative statement, (2) the defendant had an opportunity to reply and remained silent, and (3) the accusation was such that the natural reaction of an innocent person would be to deny it. People v. Goswami, 237 Ill. App. 3d 532, 536 (1992). The statement does not need to be made in an accusatory tone as long as it is evident that the defendant “was being painted or portrayed as a participant in illegal and prohibited activity.” People v. Miller, 128 Ill. App. 3d 574, 584 (1984). Further, “acquiescence or assent may be manifested by silence or by an evasive, equivocal, or unresponsive reply.” Childrous, 196 Ill. App. 3d at 53. We decline defendant’s invitation to dispose of the tacit admission rule. The tacit admission rule should not have been applied here to admit his buddy’s statements about defendant and “you guys” taking things “too far” and defendant’s failure to deny those statements. It has been noted that tacit admissions should be “received with caution.” The tacit admission rule appears to be on particularly shaky ground when a defendant is in police custody and knows the police can hear his conversation, as in People v. Soto, 342 Ill. App. 3d 1005 (2003). See also Michael H. Graham, Cleary & Graham’s Handbook of Illinois Evidence § 802.7, at 679-80 (6th ed. 1994))), and that silence could be “motivated by many factors other than a sense of guilt or lack of an exculpatory story” (McCormick on Evidence § 262, at 306), such as “prior experience or the advice of counsel” (Powell, 301 Ill. App. 3d at 278). Being in jai is a “unique” circumstance, it could not “reasonably be expected that defendant would feel free to respond” to his co-arrestee’s comments. The statements by his buddy that defendant and “you guys” take things “too far” and defendant’s failure to deny those statements should not have qualified as tacit admissions. Like the defendant in Soto, defendant here was under arrest and in a room at a police station. Further, defendant knew that an officer could hear him because he called for an officer multiple times while he spoke with his buddy. We find that defendant’s surroundings militate against applying the tacit admission rule to the specified statements made by his buddy and defendant’s failure to deny them. We conclude that there is no reasonable probability that the jury would have acquitted defendant if his buddy’s statements had been excluded. The State’s evidence was overwhelming.